An afternoon wedding reception is beautiful and glamorous and good fun, plus it is much cheaper than an evening wedding reception with a full sit down meal, here we have ideas for your afternoon food and dress. Start by setting the time of your wedding reception, the middle of the afternoon is best as then your guests will not expect a full sit down meal. If you are worried about this then you may want to word your invitation so it spells it out. "Please join us at 3.00pm for Champagne and afternoon tea at ..."
"Picnic reception to follow at ..."
Having an afternoon reception is a very personal choice and it is also a very clever one as you can save yourself lots of money and there are lots of other advantages too. 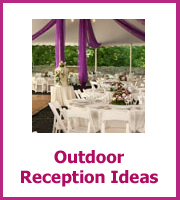 A reception in the afternoon will likely have no minimum numbers or at least a lot less than an evening event. Your guests will be able to make their way home in the light which is a huge advantage if you have older guests. You can enjoy your evening together just the two of you or choose to meet up with family and friends if you want to. Plus you will be able to see your venue the whole time, which is great if you chose it because you think it is beautiful. You will have to get up really early! Some brides I know have got up at 4am to have their hair and make up done. If evening dancing or partying is your thing you may feel you have missed out. Although to that I would say you still can do these things in the afternoon or choose to go together to your favorite club. 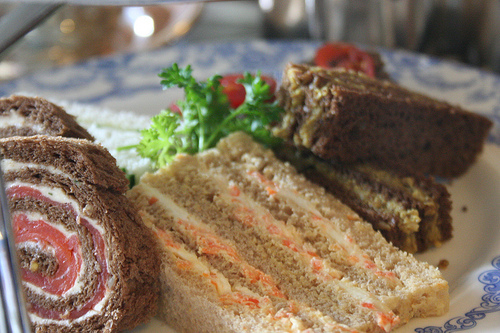 You could have an afternoon tea party, think tea at the Ritz and the glamour of the tea dance. Serve finger sandwiches ( that's tiny sandwiches with the crusts taken off), petit fours, cupcakes, tarts and your wedding cake. Your wedding cake is truly the star of this reception. Don't forget drinks with Champagne, wine, cider, Pimms, and of course tea and coffee. 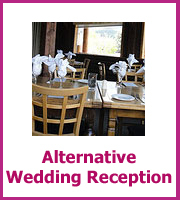 You could easily cater for your afternoon wedding reception yourself with some help. Make the sandwiches up the night before and cover with damp paper towels and plastic wrap. Have a look at your local Costco or any supermarket that does catering sized packs of tarts and mini cakes and stock up with plenty of those. While you are there also take a look at the wedding cakes as supermarket wedding cakes are really nice and there is a lot of choice to the designs. All of your drinks can also be bought at the supermarket and they often offer reduced price or free glass hire for events, you just need to have someone to make sure they all get back to them after the wedding. 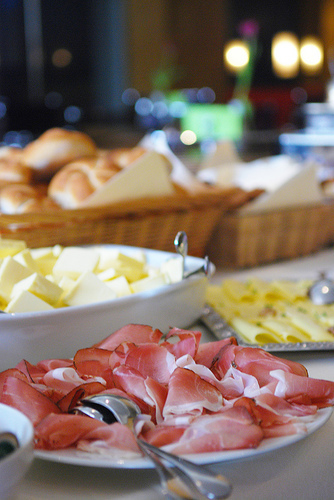 Another afternoon reception option is to have a picnic, which is almost the same kind of food as the afternoon tea reception but is more relaxed. See if you can borrow picnic blankets from all of your family and friends or even better ask them to bring their own blanket to the reception. Pack up all of the food in hampers and everyone can help themselves. 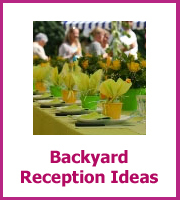 This is also a great way to have a pot-luck reception, you could ask everyone to bring a dish in their own picnic hamper. All you would need to provide is the Champagne or sparkling for the toast, some drinks and your wedding cake. 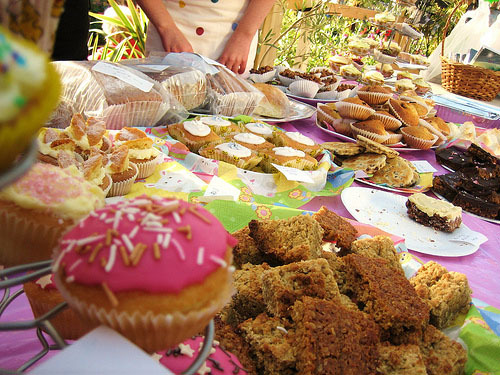 A picnic reception would be great at your local park and they often have areas that you can hire or book for very little money. 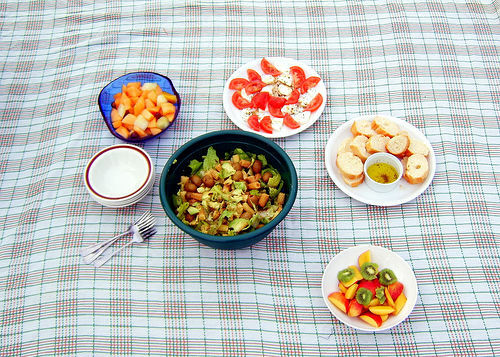 Love the idea that you have picnic blankets with a hamper on each, almost like tables. You could even have a seating plan! Some parks also have barbeque areas that you can hire and that would be a very relaxed afternoon reception, just think all the men doing their manly thing behind the barbeque and lots of relaxed fun! Crates of beer, some tunes and a very chilled afternoon. Now I know that technically a brunch is not normally in the afternoon! But this is another great way to have a relaxed wedding reception and you could time this to be nearer lunch than the the other ideas. A chilled afternoon wedding reception makes you think what kind of wedding dress would fit and as it is your day it is really up to you. A big dress may not be the most comfortable, but you have a lot of choice when it comes to shorter length dresses or even a summer dress maybe more your style. Have a look at all of the great cheap wedding gowns and dresses for inspiration. The other fab thing about having your reception in the afternoon is that your day will be longer, a perfect day, followed by a perfect evening just the two of you. Just because you are celebrating in the afternoon it doesn't mean you can't have a dancefloor and a DJ. However you might feel happier if you can close the curtains on the venue so it feels later! Bands, singers and every sort of entertainment works in the afternoon because it feels right.